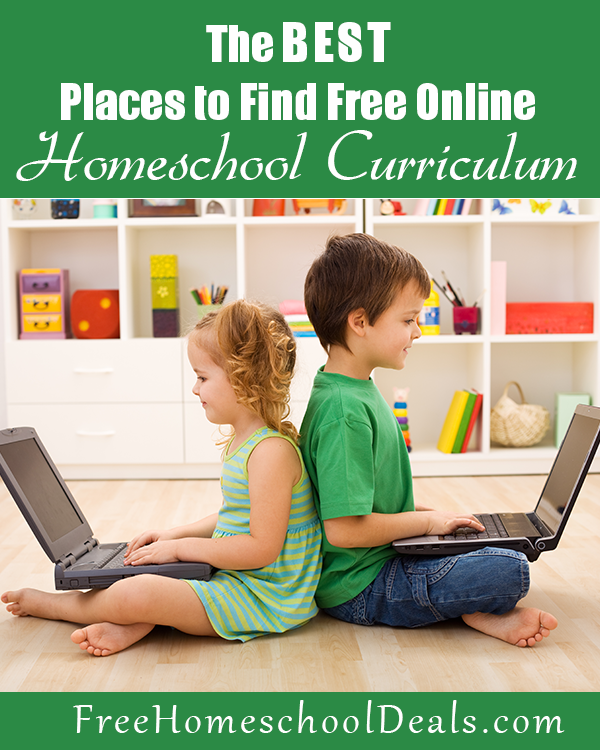 You are here: Home / Elementary / The VERY BEST Free Homeschooling Sites!! The VERY BEST Free Homeschooling Sites!! Here at Free Homeschool Deals my team and I have brought you the very best homeschooling freebies and homeschool deals for over 3 years. Even before I started Free Homeschool Deals I was a super frugal homeschool mom, working the internet and my library card to design homeschool lessons and curriculum for my children. You might find How to Homeschool When You Can Hardly Afford It helpful. I’ve also shared How I’ve Saved Thousands on Homeschool Curriculum and the Free Complete Online Homeschool Curriculum List. Over the years there are several homeschool sites that I’ve come to trust and reply upon for the best of the best in free homeschooling resources. Many of these sites we feature often here on FHD. So in my humble opinion, here’s the list of The VERY BEST Free Homeschooling Sites. Use this list to snag free stuff for your homeschool! FreeHomeschoolDeals.com *Thousands of Homeschool Freebies! * – of course I’m biased because FHD is my baby. 😉 My heart is do to a lot of the online footwork for you by being your one stop shop of the best homeschooling freebies, deals, resources, coupon codes, encouragement, and more! HomeschoolGiveaways.com Homeschool Giveaways is well-known and loved for having amazing subscriber-only exclusive freebies and fantastic giveaways for homeschoolers. BibleBasedHomeschooling.com Bible Based Homeschooling focuses on Christian educational freebies and deals. Karen usually has great deals featured on Christian Kindle books, too! HomeschoolFreebieoftheDay.com Don’t miss what Homeschool Freebie of the Day has to offer. I’ve found some really special homeschool freebies there, like the entire Handbook of Nature Study download! HomeschoolDen.com Homeschool Den offers excellent science and math printables and freebies. Some of these homeschool freebies are time-sensitive, so you’ll want to snag those quick. She has a lot of amazing freebies and homeschool resources there. HomegrownLearners.com Here she provides a list of her free unit studies and resources, however if you are willing to dig around a little you will find more goodies through out her blog. Homeschool Creations – Homeschool Creations offers all of her printables for free and has them organised by subject. 1+1+1=1 – This site has excellent quality printables and printable packs. She has a very good selection of Preschool and Kindergarten printables. 123Homeschool4Me – This site offers free printables in all homeschool subjects. She puts out new freebies every week so be sure to check back often! MamasLearningCorner Lauren has a lot of free resources on her site for all subjects with a focus on grade 6 and under. Her free printables are excellent and she adds to them regularly. This site is very organized and you can search by subject or grade. This Reading Mama – Becky has a great approach to reading. She includes everything you will need to teach your child to read and more! She does have a few resources and printables that she charges a fee for. TheMeasuredMom.com This former teacher provides detailed learning resources and free printables covering reading, writing, math, spelling and more! Only Passionate Curiosity Heather provides printables and pringable packs that are fun and colorful. She has a good combination of fun activity packs and learning resources. Money Saving Mom While this site is not homeschool specific, Crystal and her team find and provide many great homeschool resources from around the web along with resources that will save any homeschool family a ton of money. Educents.com While this site does charge for many of it’s products they also have a great deal of free items, too. 3 Dinosaurs – Cassie creates excellent packs for every subject. She produces numerous packs weekly and she keeps them free. Many of them are huge packs and work well for unit studies. Currclick.com Currclick offers free ebooks, classes, printables, clubs and more! The Crafty Classroom Here you will find a variety of crafts, printables, lapbooks, notebook pages, free printables, and a ton more! The Chaos and the Clutter This family resource site is not known for free printables, however, it does have some and provides a lot of activities and resources for homeschooling. Education Possible This site provides printables and activities for all ages and levels from PreK- high school. This is one of the rare sites that provide resources for middle and high school students. Great Peace Academy This is another site that provides activities, resources and printables for students K- high school. Homeschool Encouragement – Many printables available in a lot of great themeds including Lego and Star Wars printables. To the Moon and Back Dusty provides printables and activities for preK- 6 grade students that are fun. Most of her freebies are packs and they cover various subjects. The Multi Taskin’ Mom This site has a lot of freebies and they range from fun activity packs to great learning resources. Starts at Eight Here you will find a lot more than printables for everyone preK- high school. However she does have a good selection of free printables. Ed Snapshots This site has a classical homeschooling focus. It includes a lot of free printables and resources for all ages including some Latin studies and a nice selection of homeschool planning resources. A Teaching Mommy Here you will find a wide variety of themed activity packs with a special interest in Disney themed freebies. Miniature Masterminds This site is focused on prek and kindergarten students. She has large printable packs that are colorful and fun for little ones! 3 Boys and a Dog This site provides some nice printables from time to time, however you will have to do a little digging to find them on her site. They are worth the dig though! Living Life and Learning Known for her large themed and holiday packs, Monique provides good quality fun and learning. Look We’re Learning If you have an active child who likes printables that keep their attention try this site for great printables. Her stuff is fun and exciting and most of all a great learning resource. In All You Do – This site has a large selection of fun themed free homeschool packs that focus on holidays and general activity packs for various ages. Adventure Homeschool – This site includes many printables with a focus on learning. Blessed Beyond a Doubt – Jill has a lot of free printables and adds more regularly. Her printables are mostly packs with a fun theme. Homeschooling on a Dime Stacie has a very organized selection of homeschooling printables and resources for a variety of grades. Homeschool Share – This site has notebooking pages, educational printables, mini books, and more. One of her best features includes her large selection of lapbooks. Spell Out Loud Here you will find free printables for prek and beyond in the subjects of Bible, geography, holidays, science, notebooking, lapbooking and more! Growing Hands-On Kids – The printables you will find here are high quality learning resources. She has a variety of packs and printables related to sensory, homeschooling, fine motor, preschool, and more. Enchanted Homeschooling Mom – While this site does have a large selection of printables for members only or a small fee, there is still a large selection of free printables . She has a nice selection of series that are free including state studies and her Popping Book Nook. Living Montessori Now – This is a great site to find hands on printables with activities. She has a Montessori theme through out her site and all the printables. Well Nurtured Plants and Pillars Has a nice selection of free printables that are good quality packs for a variety of ages and cover a lot of topics. Royal Baloo – Royal Baloo has excellent free printables that focus mainly on preschool, kindergarten and the lower grades. Teachers of Good Things – While the focus of this blog not on printables, you will find some free preschool printables that are quite good, particularly for boys. Paradise Praises Katie produces printables that include holidays, family, reading, science, and more. Tina’s Dynamic Homeschool Plus Tina is known for her great planners and organization forms. She also provides a lot of other printables that are easy to find on her site including lapbooks, notebooks and more. She provides material for prek- high school. Kids Activities Blog – This is a great site to find printables and activities to go with them. They are not a printable focused site, however, the printables they do have are great. Embark on the Journey Tara provides nice printable packs for prek- early elementary students. Gift of Curiosity Here you can find fun printables that will entertain your child for days! Her packs are packed full of fun activities and kids especially lover her dot-a-dot printables. Homegrown Learners – Homegrown Learners is best known for their free Lego printables. Itsy Bitsy Fun There isn’t much you won’t find on this well organized site! Her freebies are fun and colorful and range from hands on to worksheets and printable packs. Life over C’s Kim provides fun hands on learning resources and printables in a variety of topics and for various ages. Learning Little Lovies Here you will find printables and worksheets in all subject areas. The Relaxed Homeschool The Relaxed Homeschool provides free printables for students prek- high school. She also has some planning resource. Meet Penny – Tabitha offers free printables in a variety of subjects and ages. Not Consumed – This site has a large collection of printables and packs. While some do cost a fee, there are still others that are free. This site includes homeschool printables and well as family printables. The Happy Housewife Here you will find free printables for students preK- 5th grade. She provides nice packs and learning resources. The Notebooking Fairy Jimmie provides a huge selection of notebooking pages and packs. Totschooling Here you will find all the preK and K printables and resources you will ever need! Donna Young – Donna Young is best known for planners and home and school organization sheets but there are homeschool printables there as well. Notebooking Pages – Though NotebookingPages.com is a membership site, they do offer some free notebooking pages as well. 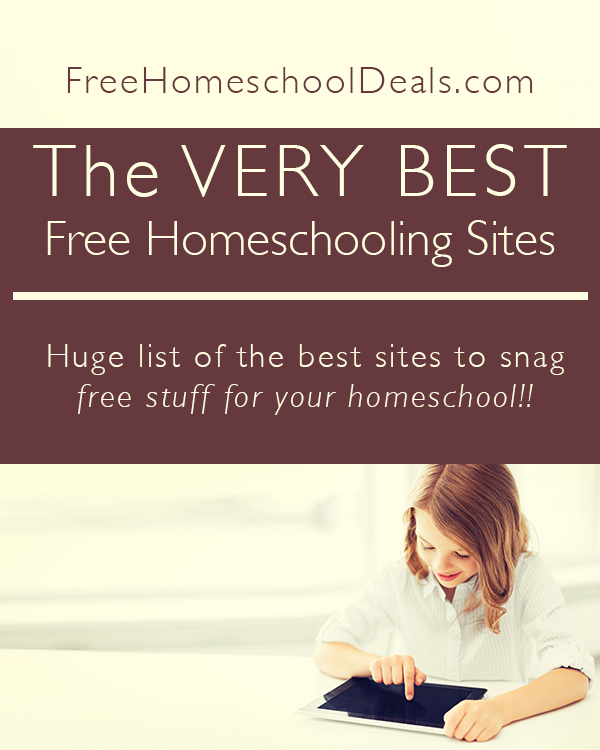 These are some of my favorite free homeschooling sites for feature on Free Homeschool Deals. Did we miss any? What are your favorite free sites for homeschool? Guesthollow.com has free high school biology curriculum. We love Easy Peasy All in One Homeschool!! Bible based and my girls are learning so much!! I love all of this information, it really takes the guess work out of where to find and search for home school materials. Thanks so much. I really wish I had this information many years ago.